Reviled by ranchers and hunters, managed through “harvesting” by state wildlife agencies, with ardent conservationists its last hope, the gray wolf has cut a controversial wake in the North American landscape ever since it was reintroduced from Canada in 1995. Watch the film on Earth Focus. About 2.6 million cattle, including calves, live in Montana. Seventy-four killed by wolves in 2011 out of 2.6 million is less than 0.003 percent. As of 2012, the Montana elk population statewide was doing well, with numbers at an all-time high of 112,000. The irrational hysteria about wolves from ranchers and hunters in the west is not based on science, just ignorance and hatred. 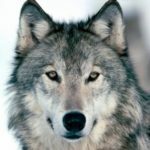 Will We Ever Coexist With Gray Wolves? Conservationists, hunters and politicians have debated about gray wolves for decades, while the animals were left to accept the closest thing resembling a consensus. The animal was nearly extinct by the 1930s, but was eventually protected by the federal Endangered Species Act in 1973. Three years ago, its protections were stripped. Adding more damage, states like Idaho have since made it even easier to kill wolves through legislation. Earth Focus traveled to Wyoming and Montana to discover if humans and wolves will ever fully coexist. Interview subjects range from Yellowstone National Park biologists to environmentalists and bow hunters. EARTH FOCUS airs every Thursday at 9 p.m. ET (6 p.m. PT) on Link TV—channel 375 on DIRECTV and channel 9410 on DISH Network. Episodes are also available to watch online at linktv.org/earthfocus.